When the department was founded in 1944 few could have envisioned the growth in our district and the demands that have been placed on the Fire Service. The department today has evolved into being “all hazards” emergency response organization. Your fire department plays a role in responding to all types of emergency situations from fires, rescues, wires down, flooding and assisting the Colonie Police and Colonie EMS Department. The fire district has grown significantly since 1944 with a major expansion in residential, commercial development and a busy Albany International Airport. Members are activated by cell phone text messaging or by radio pager. Responding members can also notify the station they are responding from their cell phone. Once arrived at the station, members don their PPE, board the apparatus and respond. In order to respond effectively to emergencies, members drill once a week. Our drills are Monday evenings and every member participates in drills to maintain status as an active member. Members drill in everything from CPR to water rescue and fire suppression. The Town of Colonie operates a training center on Wade Road that allows us to practice everything from fire suppression to auto extrication. In this picture, Verdoy Firefighters practice on a flammable gas simulator. Our core mission is fire suppression and we regularly train to maintain a high degree of preparedness for this core function. All active members are outfitted with personal protective equipment (PPE) and train in the use of self contained breathing apparatus. 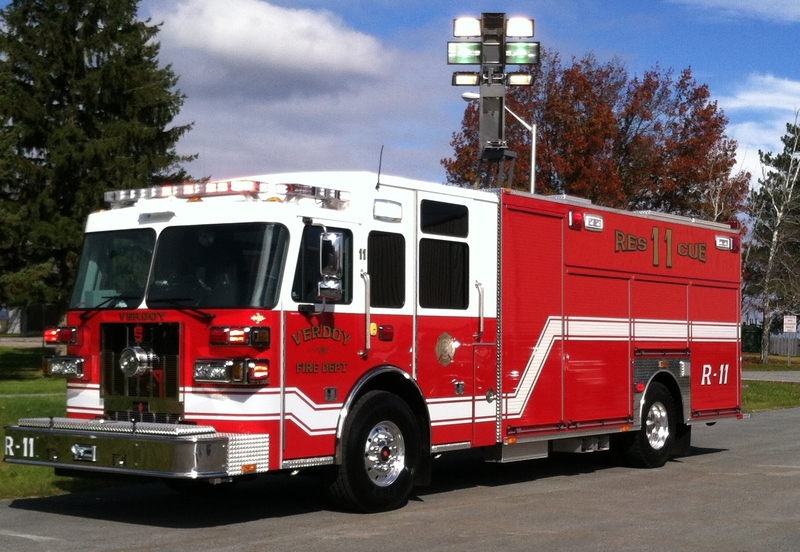 This apparatus functions as a rescue with pumper capabilities. It’s outfitted with all standard equipment found on a rescue with other types of equipment for rescue operations. It also has handlines and 750 gallons of water on board for firefighting. This apparatus is a pumper outfitted with water, large diameter supply hose, 4 pre-connected attack lines and all standard equipment found on a pumper. This apparatus is a truck with pumper capabilities, as well as having a 75’ aerial ladder it has handlines and 500 gallons of water on board for firefighting. We are equipped with Hurst “Jaws of Life” extrication tools and respond to car crashes and rescue people who are entrapped. Members train with a variety of rescue tools for lifting objects, cutting devices and stabilization tools. In this picture, Verdoy Firefighters are rescuing a trapped victim of a car crash on Albany-Shaker Road. A section of the Mohawk River is in the district and we must be prepared to handle water emergencies and rescue people from the ice in winter. We have a boat and two inflatable rescue craft for water and ice rescue. Verdoy Firefighters are practicing ice rescue techniques on a local pond. When someone dials 911 for a medical emergency, the Town’s dispatch center screens the caller and dispatches the Colonie EMS Department. 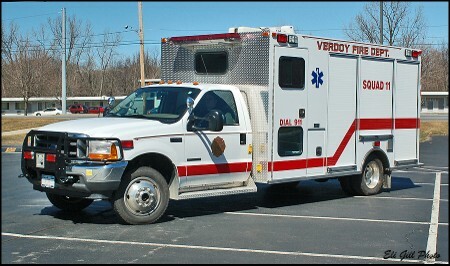 Depending on the type of emergency the closest Police or Fire Department units may be dispatched as well. 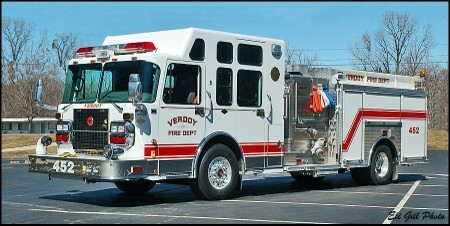 All Verdoy Firefighters are trained in CPR and are equipped with an AED and basic emergency response equipment. Many of our members are also trained as Emergency Medical Technicians. We also operate EMS 11 as our primary EMS response unit and Squad 11(below) as a secondary EMS unit as well as a utility vehicle. Fire Police are specially trained members of the department that provide security and traffic control at emergencies. 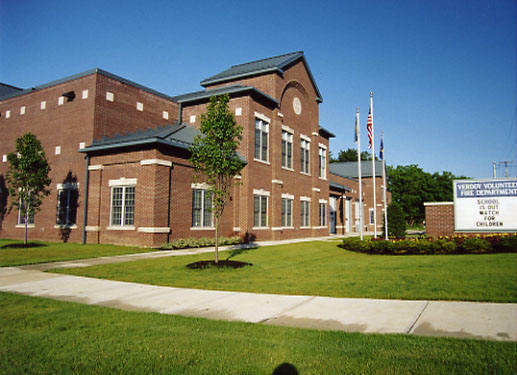 They may also assist the Colonie Police Department with traffic control and other types of incident support. The department provides annual fire prevention visits to our local schools during fire prevention week and sponsors an open house every October. We host community events in our meeting hall and we attend community functions and we go out on Halloween night to our neighborhoods to distribute candy.